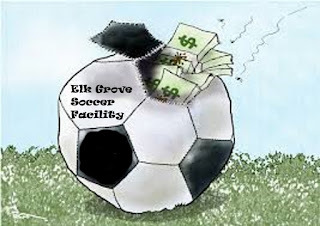 The city of Elk Grove has lent itself up to $6 million from the drainage fund to purchase 100-acres of farmland, upon which to build a sports complex and stadium. This property is located outside the city limits, east of State Highway 99. What is disturbing to me is the inconsistency of purpose by this council. SEPA is located west of State Highway 99, and yet this is supposed to be a plan for a community. What sort of community has such disjointed, geographic characteristics? State and federal highways divide neighborhoods, and make it nearly impossible for pedestrian travel. The only possible and practicable way for people to get from SEPA to the proposed stadium-sports complex would be by automobile. This alienated approach to community building begs the question: If SEPA contains the city's general plan authorization for a stadium-sports complex, then just what is being proposed here tonight-yet another amendment to the General Plan, or this community plan? What is the city's purpose in confabulating its intentions with these contradictory actions? Where do you really want to build it? And what planning language is the city using to demonstrate its intentions? I think the people of the city of Elk Grove are owed a straightforward explanation of the intentions of the city to build a stadium-sports complex. It's not clear in the General and Community Plans, and it's not clear how this kind of behavior creates community. At this point, if anything is clear, it's that the city has thoughtlessly goofed and been a poor planning agent for the people. And that's not all. On page nine of the staff report, the city's net revenue for the complex, by year four, is in the red by over $2.6 million. What's most disturbing is the lack of numbers for what is euphemistically “operator responsibilities,” including ongoing and soft-cost operations. So, should the operator decide to leave town after a disastrous run for just a few years, the city would be responsible for the complex, unable to make money, and left holding a very large bag of debt even larger than predicted in the staff report. And the real rub is in the mortgaging of the Revenue Neutrality Benefit. Any version of this project uses at least half to all of this buffer money that comes from weaning the city from the county. Incorporation was supposed to enable Elk Grove to become a city that determines its future. In the end, if it finances the sports complex with this benefit, it leaves the city vulnerable to bankruptcy should the venture fail, or should the city face a calamitous emergency, like a massive flood. It's clear that the city is hedging its bet by mentioning future sports facilities in the SEPA plan, as it will probably do in all of the forthcoming master plans in the SOI as well. But not because the city necessarily believes that a sports facility will locate in any one of those new areas, but rather it will help buttress the nexus for charging Mello-Roos assessments on all future home buyers to generate cash flow for the other dream projects located elsewhere in the city (aquatic center, soccer fields). Buried beneath the hundreds of conditions of the recently approved Kamilos project in SEPA, was a condition that future home buyers pay an annual tax assessment for unspecified future sports facilities in the city. Kamilos and Co. initially protested the condition because they feared that the tax would place their Elk Grove project at a market disadvantage. They eventually dropped their protest, because in my opinion, they either had doubts that those sports dream projects will get off the ground, and/or all future housing projects in the city and SOI will also be conditioned with the same assessment and help level the "playing field". There is nothing unique about Mello-Roos fees, but at the end of the day, the savvy consumer is going to shop around and compare their tax rate with homes in other areas of the region and evaluate what they will get for their money. Throwing in a vague and open-ended tax for recreational and sports facilities to satisfy a political dream of creating a sports mecca while also guaranteeing a revenue stream to help sell bonds may just be the straw that break the camel's back in Elk Grove. In the end, as Mr. Monasky states, stupid political decisions could place Elk Grove at a market disadvantage to other blossoming housing markets like Delta Shores, Corodova Hills, Natomas, West Sacramento, and Lincoln that have other amenties to offer. Assuming these dream sports facilities do get off the ground, new home buyers will be asking themselves whether they are personally willing to pay for a soccer stadium, Olympic-quality aquatic center with high dive, County fairground, and who knows what else? If not, then the developer flood of money to help prop up the City Council will soon dry up and be redirected to those stronger housing markets. So every time one of those glorious, generic two-story boxes on a tiny postage-stamp lot sells in Elk Grove, I will thank those buyers for helping to support our sport's mecca because that is less I will have to pay! Elk Grove is well on its way to become Stockton north. But when I do, he's right.